When it comes to FCing on the medium to large (60-150 pilots) scale, there is one question that is often asked of me: “How do you understand what is happening?” It’s something I’ve never consciously thought about addressing. After all, so much of FCing is learned through practice and experience. However, I recently realised that the way I think about the battlefield is something that affects many things – from the targets I choose to how I anchor fleets. By breaking down these internal models, perhaps I can better help answer that one question. To start out, let’s take a look at a grid. We see here two fleets, which we can further simplify as two points. The first thing I do as an FC is consider the effective range of the weapon systems used by both fleets, which can be drawn as spheres. In any given engagement, this is something many pilots will already be visualizing. Next, we have to consider the “kill zone” of these weapons – the range to which they are effective against the other fleet. This is a little more ambiguous that just optimal and falloff, and is something that comes with practice and an understanding of how both your and the opposing fleet compositions work. 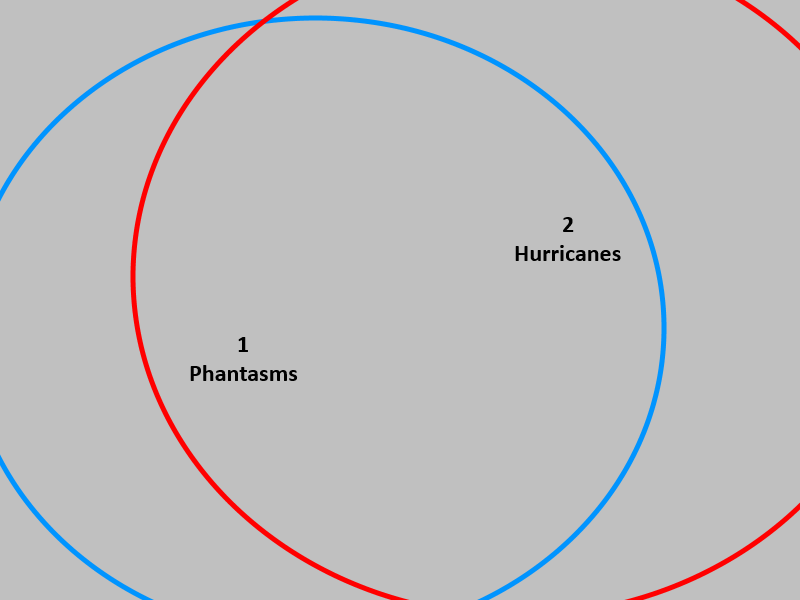 As you can see, the Hurricane fleet’s kill zone still reaches the Phantasm fleet, but the Phantasm fleet’s kill zone does not reach them back. This means that the Hurricane fleet is in a good position to fight. However, battlefields are not static. As the fleets spar, FCs will fight for superior tactical positioning – what’s known to those with an engineering background (and perhaps Kerbal players) as Delta V control. 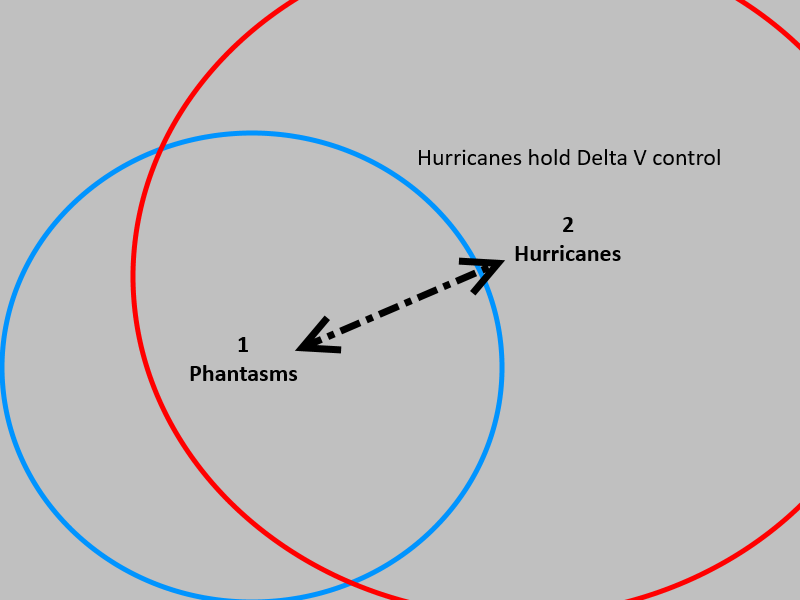 We can see that the Hurricanes will be able to hold range from the Phantasms and apply damage. This is a good position for the Hurricane fleet. However, fleets are rarely composed of just one ship type. 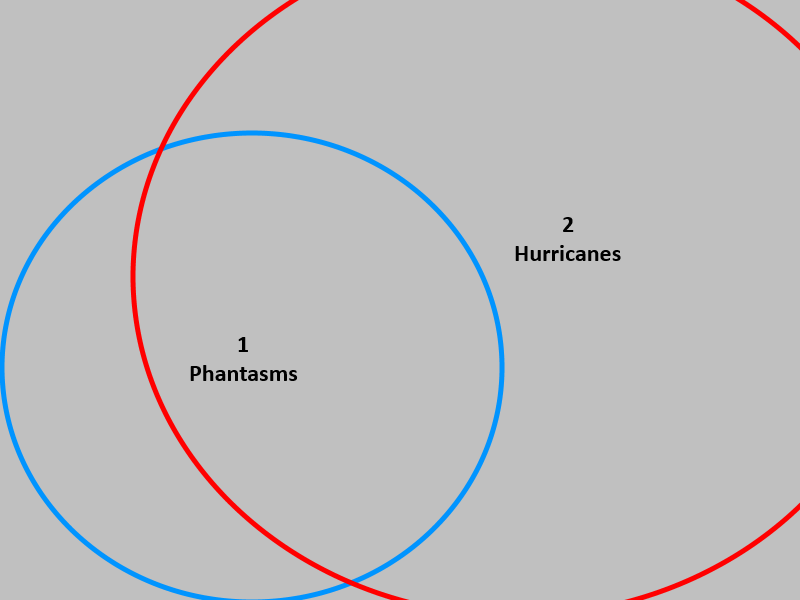 As such, we have to take into account the sphere of a component ship of the Phantasm fleet. It’s a ship type I profoundly enjoy watching slip through the grasp of every defence fleet I have ever run – The interceptor. 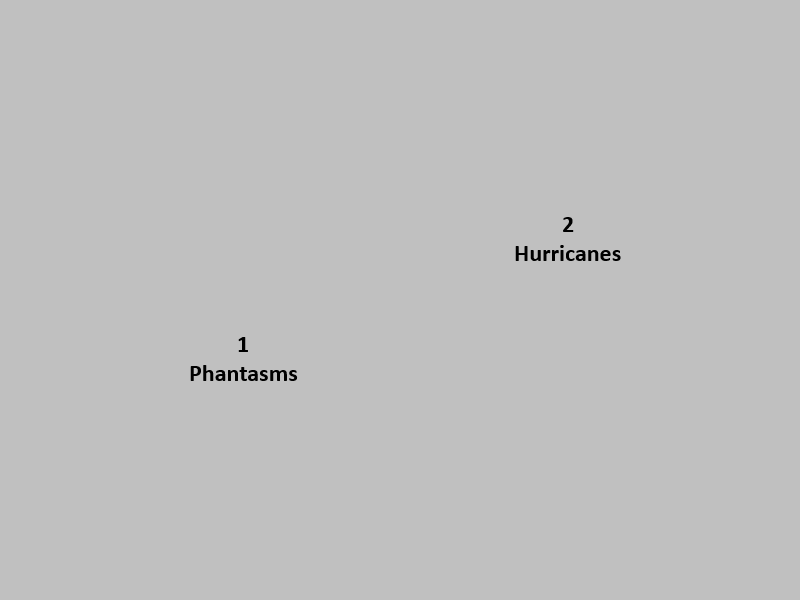 …which puts the Phantasm fleet in the place where it can trade blows and engage in honourable brawling combat. 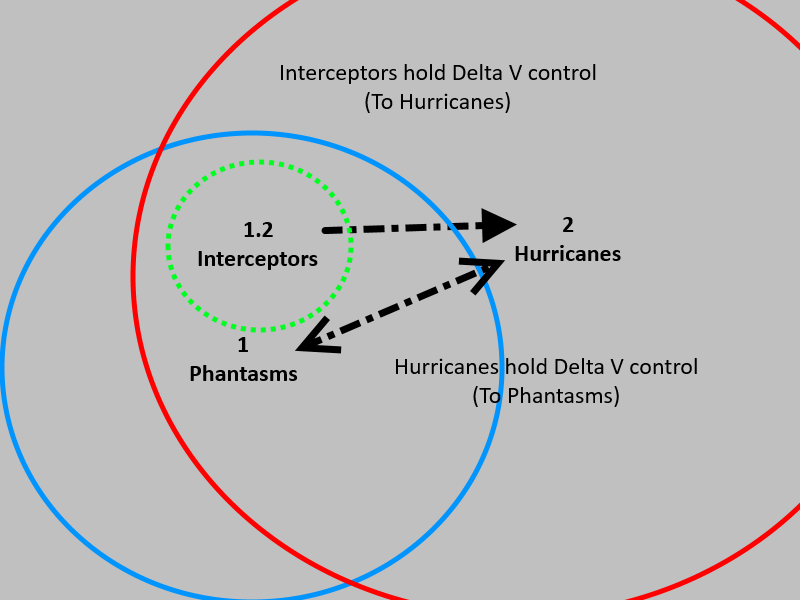 Note that interceptors can be replaced with many other ships and have the same effect. A screening wall of Huginns, heavy neut pressure, or other similar effects can produce an “area of denial” that, if a fleet hits, it will likely never pull away from. To illustrate a more complex situation, I will use a second engagement. 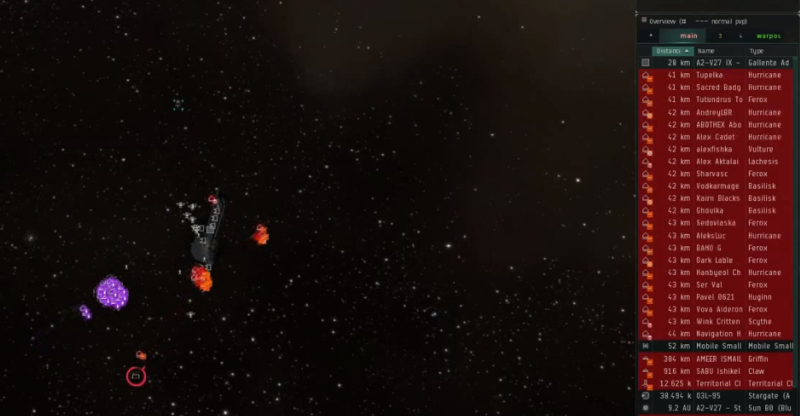 In this situation, a Ferox fleet has landed on the Phantasm fleet at 10km. 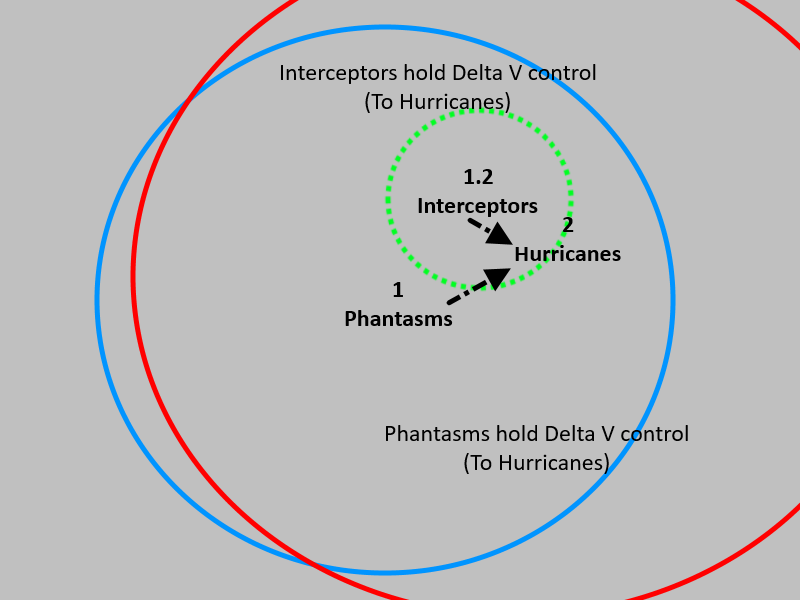 As the Phantasm fleet lacks the interceptors to hold both the main fleet and its logistics wing down, the Phantasm FC is required to make a decision as to which part of the opposing fleet to hold down. To do this, we consider the effective ranges of all the fleets involved. 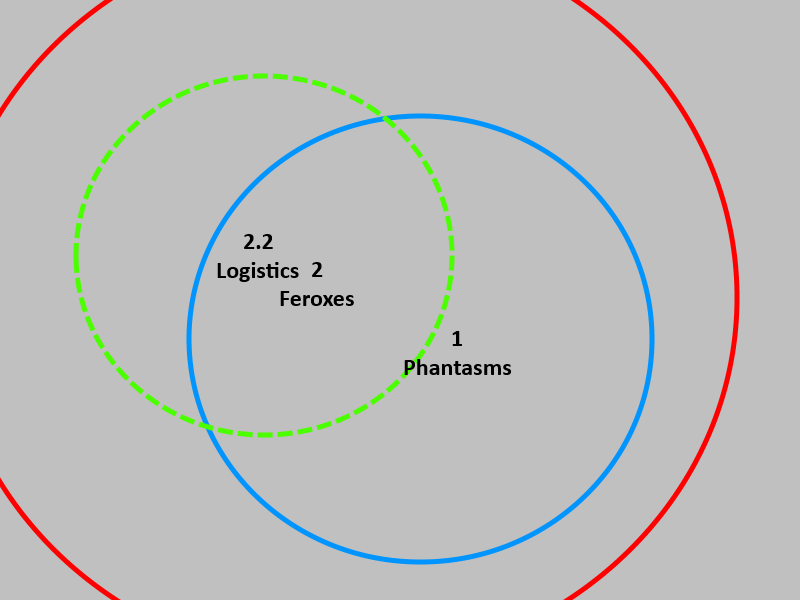 However, in this specific instance, we have one other thing to consider: the Phantasms have tracking disruptors fit, which allows them to create a buffer zone close to the Ferox fleet. 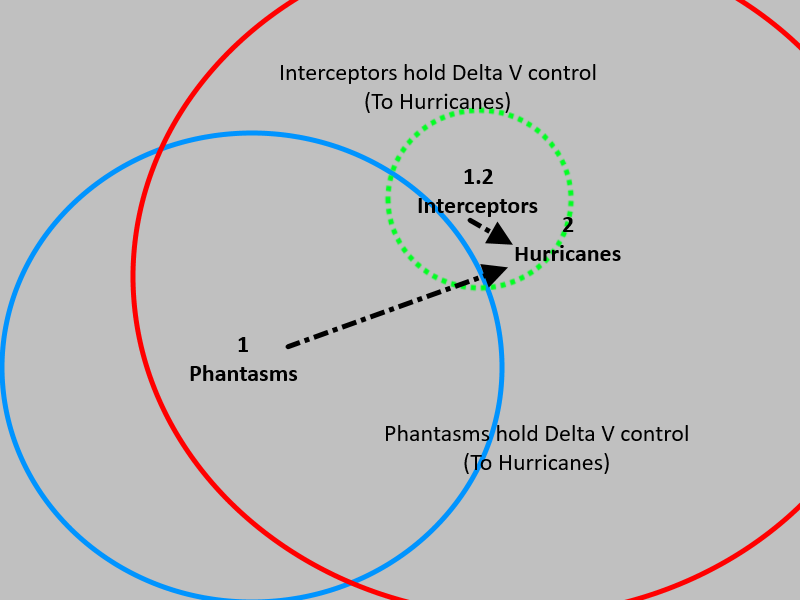 Assuming EWAR is correctly spread, the Phantasms can sig tank the railguns within that area..
With this, the Phantasm FC’s plan of the attack becomes relatively simple: get under the guns of the Feroxes, use interceptors to hold them down, and switch to the logistics wing when needed to keep them out of effective repair range. This would appear to be a lock for the Phantasms. But it’s important to remember that the width of a sphere is not static. 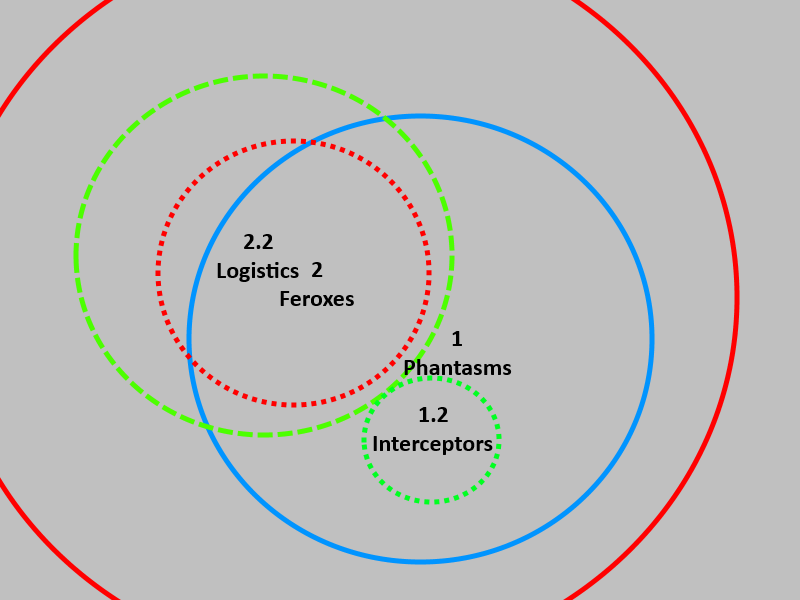 The Ferox FC can counter the Phantasm fleet’s tactics by instructing his fleet so spread out, which dilutes the effectiveness of the safe zone (as well as the damage on the boundary of the sphere, as many would no longer be able to reach that far). It’s easy to forget how spreading out affects the extreme edges of a fleet’s effectiveness, and can get you out of a sticky situation. So, with the basics of Sphere Theory covered, we move on to the most difficult part of applying it. Just how do you find out where the centre of each sphere is, and how wide it is? There are several ways to do this – but not all of them are practical for every FC, or in every way situation. The easiest, most reliable way is actually pictured above – find the enemy anchor. In larger fleets, there will likely be either spies or simple notoriety to do the work for you. Sort by name, lock the anchor, and use him to keep a track of how far the enemy fleet’s DPS, logistics, and recon cores are from you. Unfortunately, in smaller engagements, this is often not possible, as such; alternate methods have to be used. The most reliable way I’ve found to identify and keep track of enemy anchors in smaller engagements is to sort my overview by velocity. No matter if they’re using “Orbit” or “Keep at Range,” the anchor will be the one with the most stable speed. This can be difficult to do quickly, especially while calling targets. However, if you jump into a system and have time to do so, you can rather safely identify both the enemy anchor and the spread of their fleet, and prepare your mental model of the fight accordingly. This system is simple, but it helps to filter out any information that is irrelevant. It also helps to highlight both weaknesses that can be picked away at, such as one ship straying from the protective bubble of logistics optimal, and strengths to be worked around, such as staying outside of (or killing off to allow a safe approach) webbing range in a sig tanking ship. I hope this system will help FCs both old and new evaluate the way they see the battlefield, and help you better understand the positional information being fed to you as an FC. However, I don’t simply use it to identify and manage the location of ships on the grid. I also use it to recognise the ships that provide the constraints on fleet movements, and use that to pick out the targets to prioritise. 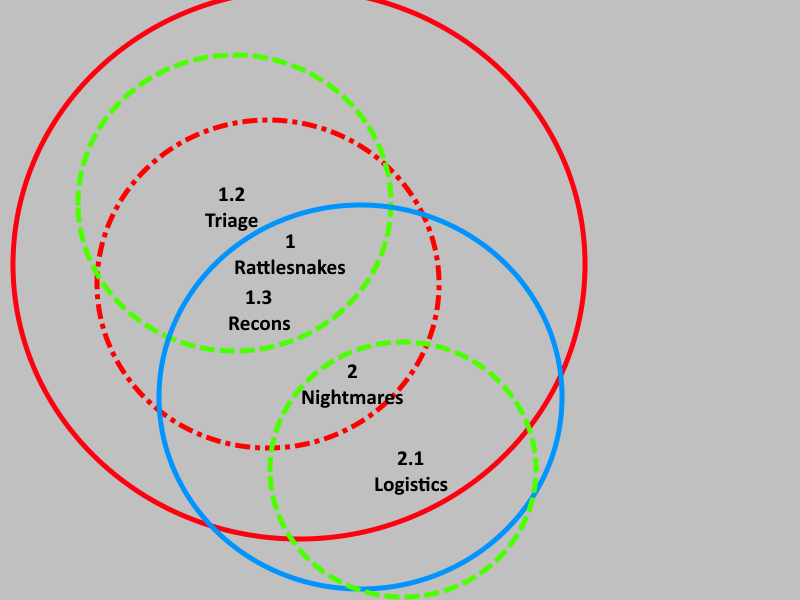 Consider how one would approach and target call against a triage & recon-backed Rattlesnake fleet as the FC of a Scimitar-backed Nightmare fleet. To do this, we will assume that you are able to warp to a ping and take a look at the fleet, and therefore choose the initial engagement range. As we know that the Rattlesnakes have less range than us, we could in theory stay at the edges of their range and try to simply break them that way. However, due to the presence of triage, we are unlikely to be able to be able to break them, which means we must kill it first, which in turn requires us to use close range ammo. However, doing this would require us to bring our logistics into the range of the Rattlesnake fleet’s recons, which would allow said Rattlesnakes to begin to chew through this vital support, taking a fight where we hold the range control and making it a pure DPS race. Forcing the Rattlesnakes to instead focus on trying to break the reps on our battleships lowers the chance of us losing ships as we utilise our range control (which is accentuated due to the static nature of Triage), as we pick off these recons. 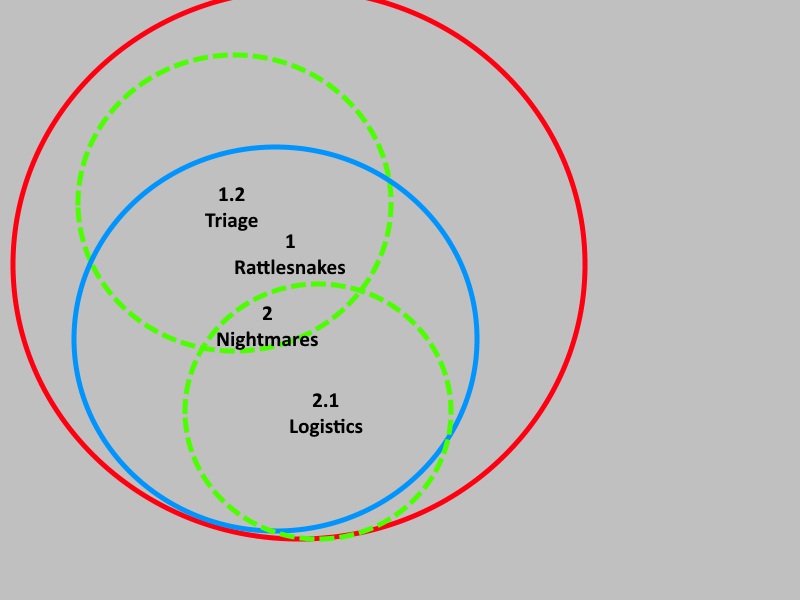 In this position, whilst the Nightmares are within the threat range of the recons, they are far less drastically affected than their accompanying Logistics, which are kept out of this range through their positioning. And, whilst they can move to aim to get within range of them, the whole fleet can pull back further than they are able to, as they are constrained by the relatively static triage positioning, allowing the Nightmares to focus down the recons. 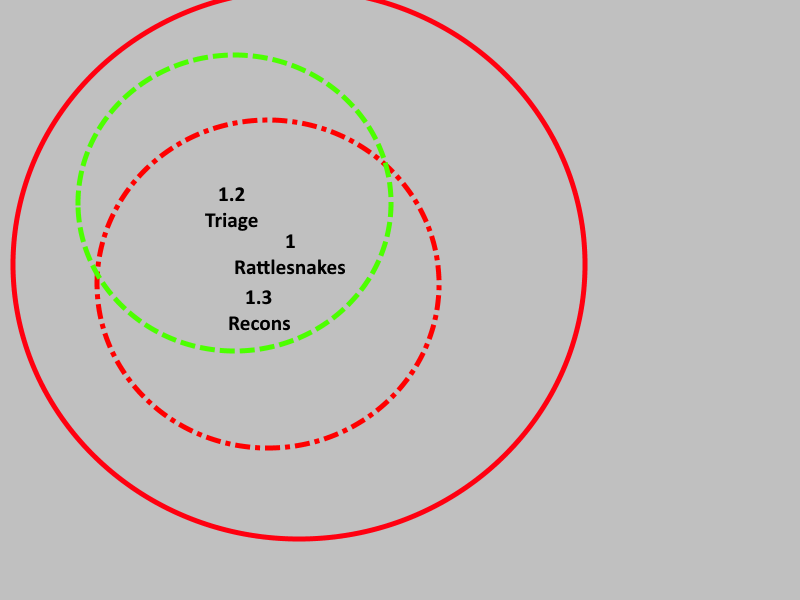 Whilst this does give Rattlesnake fleet time to focus on reducing our DPS by whittling away at our Nightmares, the movement we are able to make next – moving closer to our targets – can now be taken without endangering our critical support, which increases our own DPS as a matter of course, letting us begin to shoot the opposition’s triage. 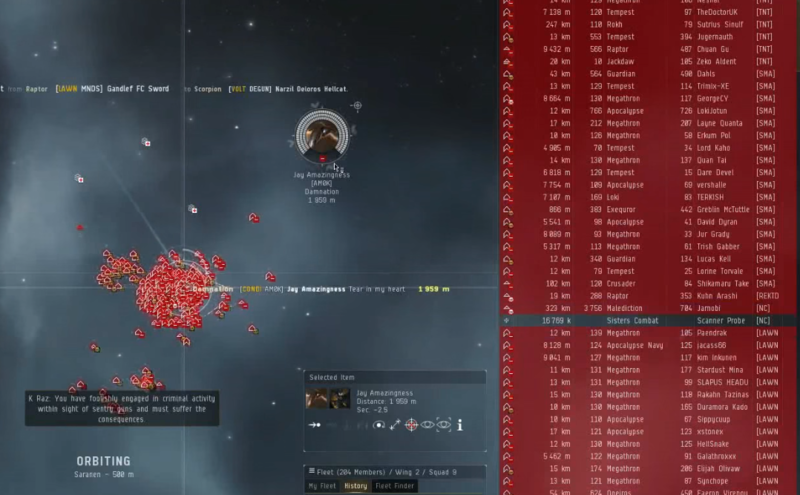 Once the triage is down, we simply have to hold point on as many Rattlesnakes as possible, and prepare for a possible second drop of capital escalation as we turn on their now vulnerable battleships. This scenario is a relatively simple one, and is obviously idealised. You’d likely only kill some fraction of the recons, with some being caught before volleys land, and then being held in pre-locks, forcing you to make a decision as to whether you needed to pull range or try and draw the fleet to a different location to re-engage it and continue to pick off their support. But, I hope it shows how you can identify what ships in the enemy fleet most constrain your fleet’s effectiveness, and choose to prioritise those first. Thus concludes my introduction to how I see the game when both FCing directly, and theorycrafting with a fleet in general. 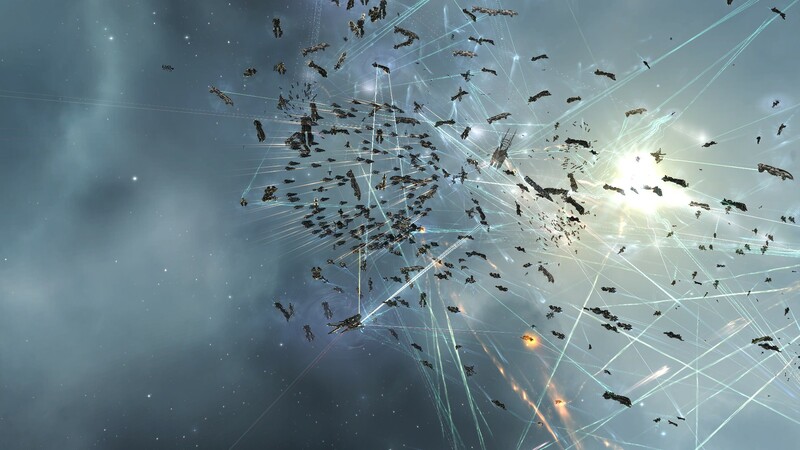 It’s not a unique way to see the game, and it certainly isn’t the only way to simplify what happens in a battle, but it does show the decisions and complexities that underline fleet combat that are often ill understood. It also shows just why anchors are used in a larger fleet context, as a fleet of pilots flying ships ‘themselves’ cannot effectively provide the kinds of area of denial needed to constrain the movement of enemy fleets. Thanks for reading – Jin.